Dr. Leana Wen has faced challenges her entire life. She was eight when her family emigrated from China and came to the U.S. seeking political asylum. As an emergency department physician at Massachusetts General Hospital, Wen helped triage some of the first victims of the Boston bombing in 2013. Wen, now 35, took over as Baltimore's health commissioner in 2015 just a few months before massive protests to the death of 25-year-old Freddie Gray while in police custody. In its aftermath, she led the city's emergency public health response effort to address social factors that led to the unrest. In 2015, Dr. Wen, seeing hundreds of people die of drug overdoses every year, took the unprecedented move to issue a citywide standing order for the overdose-reversal drug naloxone. Now Wen admits she's facing perhaps the biggest professional challenge yet. On Wednesday, she was named the new head of Planned Parenthood Federation of America. She will start in November. The choice to install the first physician to lead Planned Parenthood in 50 years is being viewed as a strategic one that helps highlight the organization's role as a healthcare provider. "At its core, Planned Parenthood is a healthcare organization, serving nearly 2.5 million patients each year," said Jennifer Welch, President and CEO Planned Parenthood of Illinois. 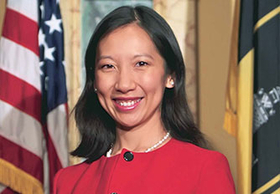 "Dr. Wen's appointment to president of Planned Parenthood builds on those roots." These are tough times for Planned Parenthood, which has been under constant threat of losing its Title X family planning grant funding. The threat could be even larger if Brett Kavanaugh is confirmed to the U.S. Supreme Court. Wen said that challenge is precisely why she said yes. "At the Baltimore City Health Department, we often speak about our core principles of public health—one of them is to go where there is the greatest need," Wen wrote in a letter to colleagues announcing her resignation on Wednesday. "At this time in our nation's history, there is one need that rises above all: the need to protect women's health and the health of the most vulnerable communities." Earlier this year, the Trump administration announced it was retooling funding criteria for doling out $290 million in Title X family planning grants. But then it backtracked on that plan. Planned Parenthood and its affiliates are challenging the new criteria in court, as the department has not told grantees the amount of the awards, length of the project, or the terms and conditions involved. Planned Parenthood health centers make up 13% of the nearly 4,000 clinics that receive Title X funding, according to the organization, yet serve for 41% of patients under the program. While Planned Parenthood has been blasted for providing some abortion services, the majority of its work involves providing birth control, emergency contraception, HIV testing and treatment services and general healthcare, including cancer screenings. "Those who attack the work of Planned Parenthood may turn their criticisms to me, my family, and even our Health Department team and partners—but another core value that we share is that we have to do the things that are hard," Wen said. Cecile Richards left the organization earlier this year after 12 years as its leader. Wen's battle against the opioid crisis has brought her national attention but she's also tackled women's health issues. In March, Wen led Baltimore's lawsuit against the Trump administration after it cut funds for teen pregnancy prevention programs. A federal judge ordered the $5 million grant to be restored to two Baltimore-based teen pregnancy prevention programs. Wen has been an outspoken critic of the administration's proposal in May to institute a "domestic gag rule" that would ban any provider that receives Title X funds from even talking to their patients about the option of obtaining an abortion. Wen's final day as Baltimore health commissioner is Oct. 12. The city is expected to conduct a nationwide search for her successor.